Manufacturing Cells – Creative Automation, Inc.
Creative Automation Manufacturing Cells: Small Footprint, Big Impact. 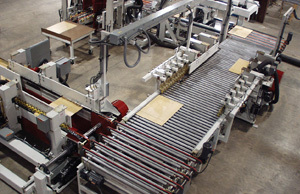 Entire manufacturing cells are engineered and built by Creative Automation to enable just-in-time production by a single operator of any number of various types of components (windows, kitchen and bath cabinet components, etc.). The following cell produces cabinet base/wall end and back panels. Overall view of a panel processing cell. 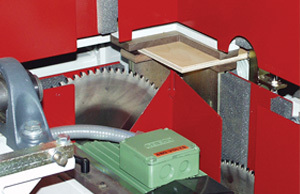 Base end panel toenotching saw with panel in position prior to cutting. 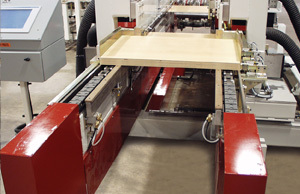 Double end tenoner automatically sizes panels and machines dados. 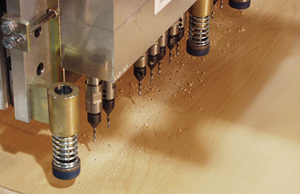 Drill is servo-driven and can accomodate a wide variety of hole patterns.